I apologize for the ultra-crap-cam image but today was an official holiday (Veteran’s Day) for the employees of the location where I work. 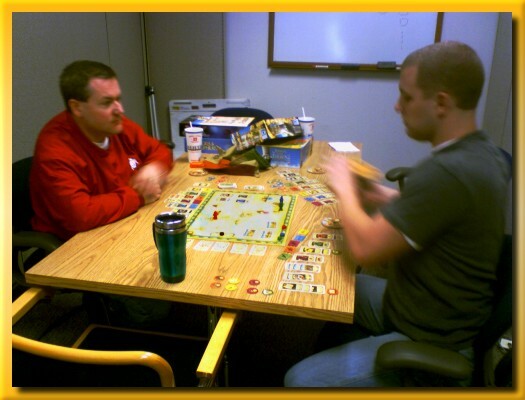 A small number of employees and many independent contractors work anyway so Rich, Jason, and I (all contractors) planned ahead and took a long lunch to play Thebes. All I had was my cellphone camera so you get what you get. I still like the game but I’m starting to get the feeling that the strategy depth is pretty thin. On my last few plays, I’ve taken the exact approach to victory with comparable results by either winning or coming in very near the top. It seems to me that the luck of the card flips (both regular and exhibit) as well as the luck of the chit pulling from the bags will ultimately determine how well I do. On my first few plays, I felt engaged the entire time but in this game, I felt like I was just going through the motions following a preset script. During those digging forays when I’d get out ahead on the time track by a few weeks I began losing focus and started noticing the downtime. Rich and Jason weren’t playing slowly either so that’s got me worried about replayability. I organized an extended game night at my house almost two years ago and thought it high time to do it again. My standing gaming group is neither large enough nor ‘hard-core’enough to play games more than once a month at the most. So, to ensure a large quorum of gamers, I invited many first time gamers from work and some others that I’ve gamed with in the past during other events. Out of the total list I ended up with about a dozen committed attendees and Lisa and I set about organizing the weekend plan, getting the food bought and prepared, etc. In the end though, I had many last second cancellations and no-shows that put a damper on the evening for me. Regardless though, I did enjoy playing the games with a great group of people. I hope I did a satisfactory job at introducing and teaching new games to new gamers in a manner that they can appreciate them. However, I need to figure out a way to be successful at organizing and promoting events like these in such a way that I can count on relatively accurate numbers. Lisa and I spent an inordinate amount of time and energy preparing the night before and on the day of the event (I left work several hours early) only to find ourselves in a position of feeling like we were holding a party but nobody came. If you have any suggestions, add a comment or drop me an email. I’d greatly appreciate tips on how I can attain attendance numbers that are at least in the same ballpark as the numbers from the RSVPs. Enough belly-aching and let’s get to the games. After Bob, Sonny, Brian, and Mike arrived, I got them involved in Union Pacific. 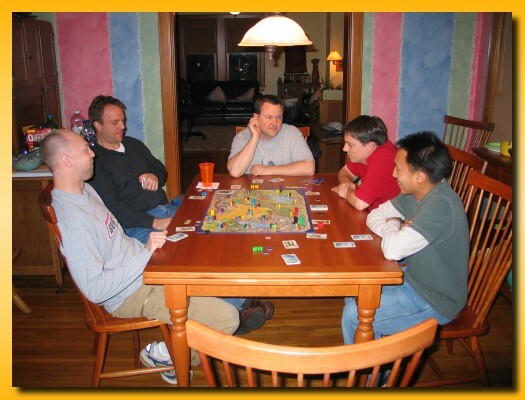 I have yet to play the game myself, but I didn’t have any problem teaching it to group of relatively new gamers. I sat out so that I could help organize another game when more people arrived. I think the game was a hit with them because I heard the telltale chatter that occurs after a good game. “Hey, if you did X I would have done Y.” “Yeah, well I was ready for that because…” The game came up several times through the night so I think it was a good choice for new gamers. After Rich, Jason, and Tim showed up we played Hey! That’s My Fish and Coloretto. 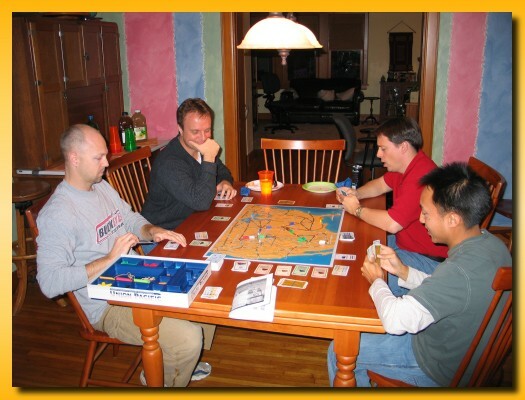 By the time we finished, the Union Pacific game had broken up and we took some time off for some food and then reorganized for a pair of games on two tables. 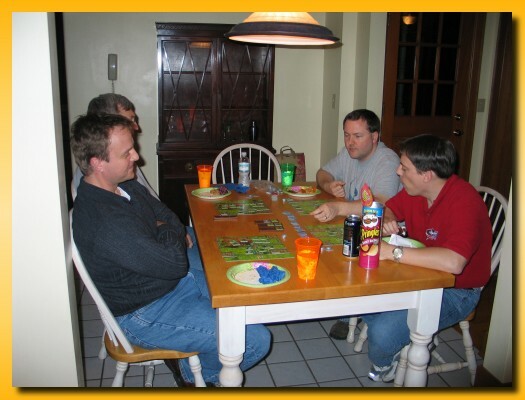 Rich, Bob, Mike, and Tim took the kitchen table for a game of Zooloretto. 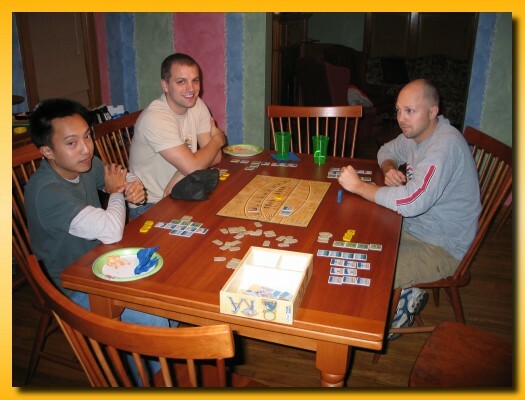 While they were playing, Jason, Sonny, Brian, and I played Ra on the dining room table. After Tim and Jason headed home, we broke out Elfenlandas our closer for six. Elfenland makes my head hurt. The first few times I played it I was totally lost. The relationship between the travel tokens and the cards made sense but I just couldn’t wrap my brain around how to organize them in a coherent pattern of use. This time was different. I didn’t win but I did tie for second. I didn’t feel lost in the game and felt like I could see the options in front of me and had a plan every turn. Maybe I just need an entire night of gaming to get warmed up. Well, thank you everyone for attending. I did have a good time and I will organize more of these in the future. However, bear with me while I learn to be better at it.